Writer & publicist doing my best to be kind to Mother Earth. This entry was posted in Uncategorized and tagged advertising, environment. Bookmark the permalink. Quite a risky and brave approach if their aim was to get people buying. But I do really like the message and how it says so much about them as a company. 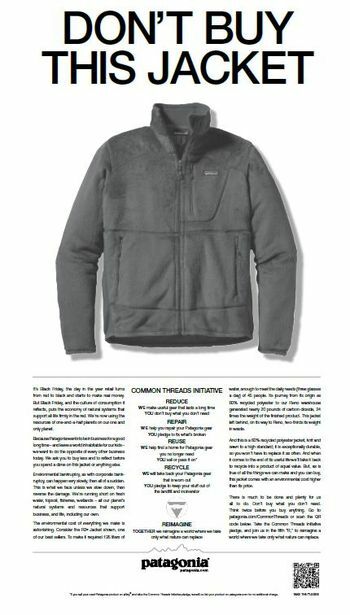 As you can imagine I LOVED this ad — and having worked with the Patagonia folks over the years, it really resonates as authentically Patagonia thinking. It’s also a great teachable moment tool for discussions we’re trying to have at our house about balancing the giddyness of the giving season with thoughtfulness and consumption. Bravo Patagonia!